Our intrepid Director of Product Development, Anita Root, made her second (!) visit to Antarctica last November. We sat down with her to hear about her adventure. In the first installment of this two-part interview, we talk about Anita’s impressions of her journey: the ship, the natural beauty of Antarctica, the educational programs—and of course, the wildlife! 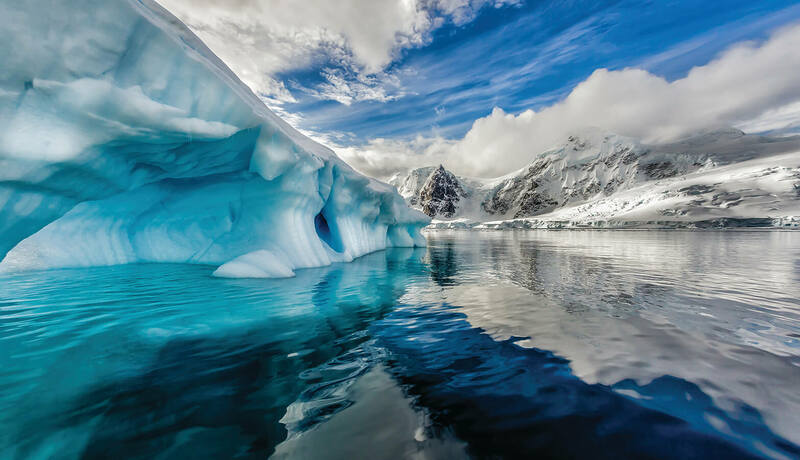 Read on to learn more about why this “cool” destination is quietly climbing the ranks of many world travelers’ bucket lists. So Anita, I’ve seen some of your pictures, watched the amazing video that Albatros Expeditions put out, and I’m excited to hear your impressions. Briefly, let’s talk about how plans for this trip came about. Why go to Antarctica and why were you the one to go? Anita: Antarctica is not for every traveler, but there is a lot of growth in this expedition market, so it made sense. When we found the ship through Albatros Expeditions, everything lined up. It was the right type of ship, it was the right size of ship…. We thought that if we could find the right ship at the right price but still provide great value with an “expedition” feel, that would be a great fit for our travelers at Go Next. This was actually the second time I’ve been to Antarctica. I had firsthand knowledge of what it’s like. So to go again? I was very excited. It was almost an identical itinerary to what I did before, except this ship—even though it is an expedition ship—is much more comfortable. So this wasn’t your first trip to Antarctica. Did anything surprise you this time around? What will our travelers not expect? A: When I first thought of going to Antarctica I thought of penguins, and you certainly see many of them and then some. But I wasn’t prepared for how beautiful it was. It’s more beautiful than any mountain range I’ve seen in Europe or the Rockies. It’s just so majestic. There’s no development, it’s just nature. Your pictures, themselves, are stunning, so to hear that even knowing what it looks like you weren’t prepared for it…. 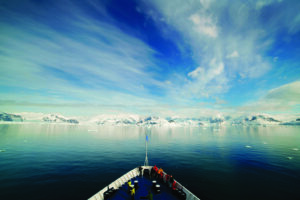 A: You spend two days crossing the Drake Passage. And you wake up in the morning and see land. You go through the South Shetland Islands first but then you start seeing mountains and hills—it’s quite amazing. When you first see a towering glacier you think oh my goodness I’ve never seen anything so blue. It’s a blue you just don’t see. It’s so dense, the blue of these glaciers. Then when you hear it calving off, the whoosh, you realize, wow not many people are fortunate enough to see and hear that. It’s beautiful. What did you anticipate the most this time around and how did it live up to expectations? A: There’s a lot of talk about the Drake Passage. It’s unforgiving. It’s either the Drake Lake or the Drake Shake. Even when it’s calm there are rolling waves. I’ve crossed it four times and only one of those times it was a rough trip. It was just fine this time around. Your sea legs come pretty quickly. And the Lemaire Channel, which is as far south as I went, it takes your breath away. Because it’s so narrow, everything is right there. There are these grand peaks right next to you, snow covered. There are floating glaciers, there are seals on the glaciers, it’s all just so close. You can hear the icebergs calving—it’s when the ice falls off of the icebergs—so you can hear it crack and there is a whoosh. It’s amazing. Isn’t the Lemaire Channel the place that photographers like? A: Yes because it’s the narrowest place that you go. The ice is everywhere, on all sides. I understand there are scientists lecturing on the expedition. What can you tell us about the programs they built for this unique region? A: There are 20 Zodiac drivers. For the majority of the Zodiac drivers their other specialty is they’re ornithologists, marine biologists, geologists, general historians…. You’re on the Zodiacs with them for a couple of hours, so you can ask them any questions you want. On this trip, the crew were from 25 different countries. We had people from Indonesia and the Philippines, Honduras—not just colder areas. All of them have different expertise. And you realize they are some of the most fascinating people you’ll ever meet. At dinner, if you invite them to sit with you, you can ask them questions all night long. What kinds of programs did they offer? A: The ornithologist was the first one who lectured. He talked about the birds we saw as we crossed the Drake Passage. He had a lot of knowledge about penguins, too. We had a marine biologist whose specialty was minke whales. She had three different lectures on the different kinds of whales and the seals that we saw. The general historians talk about a lot of the old explorers that you’ve heard about, Roald Amundsen and Shackleton, but also exploration. Port Lockroy and the scientific huts, there is a lot of lore around those. The geologist not only talks about the glaciers, but one of the places you can go to, Deception Island. It was a volcano that blew its top. You can go into the caldera of this volcano on the ship. He talks about super volcanos and how they formed. And every trip also has a professional photographer that will teach you how to take pictures of birds in motion, how to take the best still shots, how to take pictures in brilliant white (because there’s so much snow), and our photographer showed us how to use his photo editing tools. And you have some amazing pictures of the wildlife on your trip. Tell us more! Your most memorable encounter—? A: Some of these animals are not afraid of humans. When you go to the area where the penguins are walking around and mating, they walk right up to you. They just sit there and stare at you! You’re told you can’t get closer than five feet, but they can come a lot closer to you. You can just sit there and they’ll come right up to you. [The expedition leaders] cut some stairs out of ice coming off a landing. We walked up them and then later a penguin came up using our stairs and just sat there staring at us. Just looking around. And we couldn’t pass by…. That says a lot about the area, that the wildlife wasn’t afraid of you. 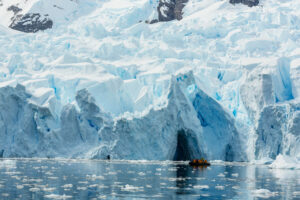 A: We had a morning in the Zodiacs when we came around this big area with all of these icebergs. 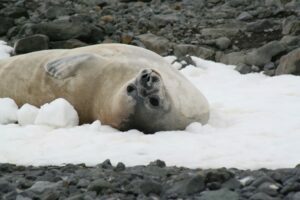 [The expedition leaders] told us they’d seen a bunch of crabeater seals earlier—they just said “a bunch.” We counted more than seventy. And they were just laying on this beach of snow. They didn’t even look up when we went by. They were just like all these big blobs. We took a turn around another corner and there were thirty more. In just that one area there were about 100 seals. A: Maybe 30 or 40 feet. They don’t smell good! That many together…. Our Zodiac driver thought maybe they had been up all night eating and they were just kind of exhausted from eating so much. And they were crashed. What other wildlife did you see? A: We saw minke whales, and there were humpbacks. They didn’t breech but we saw a lot of blows and then you could see their tail come up. 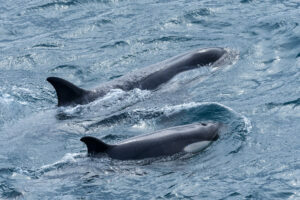 Orcas, we saw one day. The whales start to come to Antarctica in November, December. And then we saw three kinds of seals: leopard, crabeater, sea lion. I didn’t even know they had that many kinds of birds there! A: Yes, four kinds of penguins, many types of albatross, petrels, cormorants…. 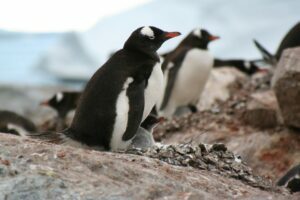 November is when these three kinds of penguin—adélie, gentoo, chinstrap—are finding their mates and building their nests. In January is when the babies start hatching. The time [the Go Next travelers are] going to be there is the best opportunity to see these new chicks. So any last thoughts you want our readers to understand about your trip? A: So how many people a year go to Antarctica? It’s maybe 35,000 people a year. And I thought hmm, how many are going to be at the Super Bowl? Probably about 70,000. And so the number of people who go to Antarctica in a year, you could double that and that’s who would sit in the Mercedes Benz stadium. So that puts it in context, that it’s not for everyone. But it’s probably for someone who wants to get to the seventh continent to get it off their bucket list. 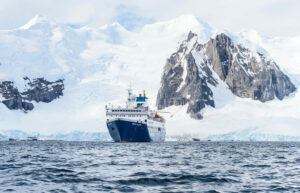 For the second installment in Anita’s interview, Destination Antarctica Part 2: Is a Cruise to Antarctica Right for You?, learn about what is different about an Antarctic cruise, what an expedition ship is like, how to get into a Zodiac, what gear to bring, and more! 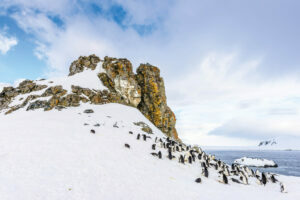 You, too, can cruise Antarctica with Go Next, departing January 2020. Find details here!